The Coral Reef is located in The Sea with Nemo and Friends Pavilion in Epcot. The restaurant is decorated in shades of blue and green and it is dimly lit. It contains the world’s largest manmade aquarium which contains 85 different species of tropical marine life. The restaurant has tiered levels so everyone can enjoy a view of the aquarium. We arrived at 11:50 am for our 12:00 pm and were seated immediately at a table located right next to the aquarium. Halil, our server greeted us and let us know that we could get the smoothies on the Deluxe Disney Dining Plan. We decided to order the Wild Berry and the Lava Smoothie (raspberry and pina colada). Both were really good. When he returned to take our order he presented us with personalized menus that I had the Coral Reef put together for us. They contained pictures of us at Disney starting with our honeymoon and had the lyrics to “Someday My Prince Will Come”. 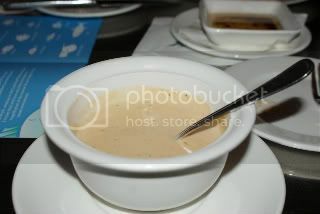 I went with my usual Lobster Bisque with Chervil and Brandy to start off my meal. It was rich and creamy. A favorite of mine that is never disappointing. 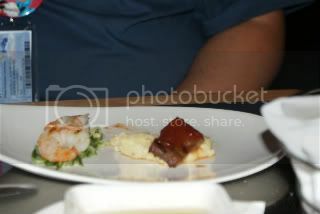 My husband started off with the Sea and Land, grilled shrimp with cucumber salad and BBQ beef skewer served over creamy polenta. The beef was nice and tender and not chewy at all. Our entrees were delivered shortly after we finished our appetizers. I had the Pan-seared Tilapia served over a roasted white bean salad tossed in a tomato vinaigrette and topped with a parmean cheese crisp. The tilapia was crispy on the outside but moist and flaky on the inside. The salad was really good. It was a nice light meal to start the day out with. 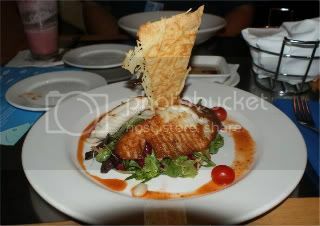 My husband had ordered the Grilled Mahi-Mahi which was served over Israeli couscous and topped with a pineapple chutney. 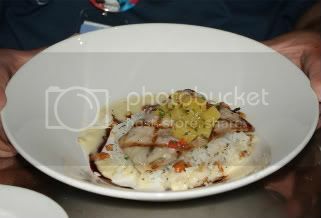 The fish was cooked perfectly and the chutney was a nice accompaniment to the fish. Between the two my tilapia was the better. For dessert we had ordered the Bailey’s and Jack Daniels Mousse which was topped with chocolate ganache and chocolate cigar and the Chocolate Wave which was served with brandied cherries. The mousse was light and fluffy. It had good flavor too. The cake was chocolate upon chocolate. A great dessert for chocolate lovers. The best part of this dessert is the cherries which are wonderful. It kind of reminds me of black forrest cake with the cherries. While we were having dessert the divers showed up in the aquarium. One came over to our table and another to the one behind us. Each contained a sign with a special message. I had told my husband to take a look at the divers and he took a glance before looking back down at his dessert. I said to him again to look at the diver. This time he noticed that the diver had a sign that was for him. Along with the personalized menus I had managed to get a diver too. Needless to say he was very surprised. This restaurant is one of my favorites in Walt Disney World. The food is always good and we receive great service too. The aquarium is nice. Where else can you dine and get to watch big sea turtles and sharks? It’s a dining experience that everyone should try at least once and if you don’t like seafood they do have chicken and beef on the menu as well.